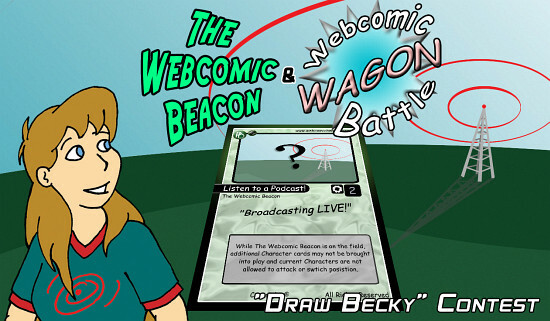 We’ve seen many people draw Becky presenting various episodes of The Webcomic Beacon. Now let’s have a contest to make the official card art of Becky for The Webcomic Beacon’s Official Promo Card for WAGON Webcomic Battle Trading Card Game! Many may enter. ONE will win! Similar to that of the card art contest for the Jenny Everywhere Promo Card, one main addition to this will be that all art may also be used in actual episode cover art as well! However, only one person’s art will be used for the card. The top ten art submissions will (for sure) be featured as Episode Cover Art (eventually), as well as receive a copy of the final Promo Card! The #1 winner (by vote), will win the newest deck of WAGON Webcomic Card Battle, when released, and TWO copies of the Webcomic Beacon Promo Card! Contest runs from now until November 29th, 3pm Eastern, USA. with the Subject: “Becky Beacon 2009 Contest”. Voting will start within 24 hours of the submission end. The top 10 will be picked by the hosts of The Webcomic Beacon, and then be publically voted upon, to find the best one! Voting will run until December 5th 12:01 am Eastern, USA. Artistic content may not be above a PG rating. Submissions should be non-compressed (Save at max quality). Submissions should be in a high quality (see above) PNG, GIF, TIF, or even PSD. Do not include any words. Final images may be slightly cropped for detail or best fit. Do not include a background. We’ll be using our usual scene. More than one submission, per artist, will not be accepted. Already submitted art cannot be used. Sorry! We want NEW art! If multiple votes by a single person is detected, ALL of THEIR votes will be disqualified. Everyone has the right to CHANGE their submission ONE TIME before the deadline. Everyone is welcome and eligible to participate except for the hosts of The Webcomic Beacon. Void where this type of contest would be considered illegal. Contest is free to enter. The top 10 entrants’ art (picked by hosts) will for sure be used as podcast episode cover art, eventually. First place (pick by public vote), will win the coming WAGON Webcomic Battle Delta Deck, in addition to TWO (2) copies of The Webcomic Beacon Promo Card, featured said winner’s art. “WebcomicBeacon.com” will be placed as the card’s main URL. The “Becky Beacon” character is copyright of The Webcomic Beacon and Fesworks, LLC. Name credit and copyright will be given for the artist of the winning card. This is a Promo Card. It is not to be sold, so there is no revenue to be made or split. Additional information about the cards, decks, and game can be found on WAGON Webcomic Battle’s website. Otherwise e-mail either The Webcomic Beacon or WAGON Webcomic Battle with your questions and/or concerns. Rights: WAGON Webcomic Battle and The Webcomic Beacon DO NOT claim your submitted artwork’s rights. They are YOURS. Non-Compete Clause: In the unlikely event of another, different Trading Card Game, winners may not use the same exact art for it. Fesworks and The Webcomic Beacon are responsible for running this contest. Any concerns about it should be addressed to them. Both WAGON Webcomic Battle and The Webcomic Beacon are on servers in the United States of America.